All buildings and the Museum are open from 1:00 to 3:00 the 3rd Saturday of the month from April through November. Lehigh Valley Passport to History is a partnership of historic sites and resources in and around the greater Lehigh Valley. Each site will have historical activities, events, tours, and exhibitions. At GWHS, our entire site of three historic buildings will be open for FREE from 9:00 to 4:00. Learn about hearth cooking in the Ralston-McKeen House with an all day demonstration and tastings. Enjoy the beautifully restored rooms in this 1795 stone home and check the progress on the kitchen wing restoration. Step into the 1785 Wolf Academy, with its beautiful arched ceiling. Our namesake, George Wolf, attended this school, and later became its principal. He later became the 7th governor of Pennsylvania, and most notably signed into law the Common School Act of 1834, which was the beginning of the public school system in Pennsylvania. The Monocacy School with its three classrooms, houses our Museum, meeting room, and a working kitchen. The Museum will house a special sampler exhibit. Other activities taking place today are a Civil War encampment by the 153rd Pennsylvania Volunteers, craftspeople demonstrating their crafts, children’s games, and more. The GWHS is a proud member of the Lehigh Valley Passport to History partnership! Check LVhistory.org to find other participating historic sites, museums, and events. In lieu of our monthly meeting, a field trip is scheduled to a local historic site. More information to come. For 39 years, we have opened private homes, along with our historic buildings, at the start of the holiday season. Each year we select a variety of early homes to showcase, usually a mix of stone, brick, log, and frame vernacular homes of the area. All homes will be dressed in their Christmas finery. Tour hours are 10:00 to 4:00. 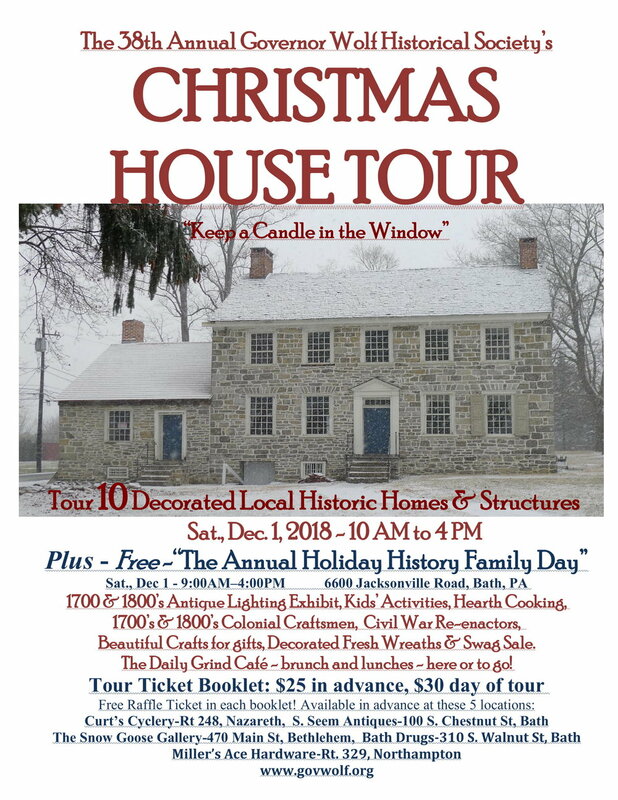 In addition to the House Tour, our whole site is open, starting at 9:00, with crafters, vendors, open hearth cooking, kids activities, strolling carolers, fresh green wreath sales, Civil War encampment, and more. This is a free family day event. Live music in the historic candlelit Wolf Academy. More information to come. Come out for a rollicking good time with “Pawnshop Bound” in the historic ambiance of the Wolf Academy. Admission $15/single, $25/couple. Light refreshments available, BYOB, must be 21. Doors open at 6:30. Music from 7:00 to 10:00. This is the final Tavern Night of the season! We'll be back again in September. Come early to get your seats! Monthly meeting, held 2nd Tuesdays, 7:00 to 9:00. In honor of St. Patrick's month, we are proud to present the fabulous Celtic family band "Seasons". An evening not to be missed! Doors open at 6:30. Music from 7:00 to 10:00. More info to come. The next Tavern Night will be Apr. 12. The 11th Annual GWHS Antiques Show takes place on Saturday and Sunday, Mar 2nd and 3rd, 2019. One of the finest Antiques Shows in the area, with 25+ dealers showcasing early furniture, along with decorative and unique items for sale. Delicious food provided by Daily Grind both days. *** NOTE *** Show will close at 3:00PM Sunday due to impending snow. The fabulous "Christopher Dean Band" will be in the Wolf Academy this evening. Gallows Hill Spirits will be featured. Upcoming Tavern Nights will be Mar. 8 and Apr. 12. Come out for a rollicking good time with live music in the historic ambiance of our early buildings. Admission $15/single, $25/couple. Light refreshments available, BYOB, must be 21. Our first Tavern Night for 2019! Back by popular demand, “Midnight Shift” will be in the Wolf Academy this evening playing classics, rock-a-billy, and more! Art exhibit in Monocacy building by Local artists, Joe Ioccio, and James Doddy, instructor at Baum School of Art. Chili, corn bread and baked items from “Blend” for sale In the Monocacy School. Bring your gang! Doors open at 6:30 to claim your candlelit table. Upcoming Tavern Nights will be Feb. 8, Mar. 8, and Apr. 12. Please plan to come out! You are invited to join us for our 5th annual Candlelight Christmas Concert. This year our concert features Robert Mouland, a rare musician - a combination of performer, historian and storyteller who uses period instruments and clothing to educate and entertain with an unparalleled authenticity. Doors open at 6:30. Light refreshments will be served. $25/couple $15/single. Tickets can be reserved or are available at the door. Please contact us for more info. For 38 years, we have opened private homes along with our historic buildings at the start of the holiday season. This year’s homes, stone, log, brick, and frame, are all located within an easy drive of our site. All the homes will be dressed in their Christmas finery. $25 advance tickets are available at the vendors located on the poster below, $30 day of tour at our site only. Tour hours are 10:00 to 4:00. See map below for tour area. This is an easy tour to drive this year! The whole site is open, starting at 9:00, with crafters, vendors, open hearth cooking, kids activities, strolling carolers, fresh green wreath sales, Civil War encampment, and more. This is a free family day event. Daily Grind, of Bath, will be there with delicious breakfast and lunch specialties to eat in or take out. Roaring fireplaces and 1800s costumed craftsmen and women will greet visitors to our free family history day on December 1 at the Wolf Academy Historic Site. Vendors will be selling handmade crafts. Craft demonstrations include hearth cooking, weaving and spinning, furniture making, and more. There will be displays of hand forged iron kitchen tools, long rifles, powder horns. A PA Civil War winter encampment will take place. Children can meet a one room school house teacher and enjoy making crafts. Strolling carolers and pony rides (weather permitting). Decorated fresh wreath and swag sale. Our theme this year is “Keep a Candle in the Window - a Celebration of 1800s Lighting.” A wonderful array of early lighting, from Betty Lamps, rush lights, candles, to oil and spirit lamps will displayed in our museum and historic buildings. Daily Grind will once again be set up in the Monocacy School for breakfast and lunch to eat in or take out. Hours are 9:00 to 4:00. Admission is free, but donations accepted. Make a large 22" beautiful wreath for your door! Varied fresh greens, cones and a your choice of a beautiful florist style bow done in a fun morning on the historic campus of PA's 7th governor in the 1800's- Governor George Wolf. All supplies for your wreath are provided. If you want to add your own additional decorations, your own holly, (berries, silk Poinsettias, ornaments, etc. ), bring them along. We will show you the florists' tricks of adding them! There will be hot coffee, tea, soft drinks and Christmas cookies for you to munch while you are working. Want to share some of yours? The more the merrier! Please sign up- soon. Our class is already filling. Time: 9AM - 12PM - PLEASE be prompt to begin! Tools: Please bring a scissors, good pruning clippers, (gardening gloves if you want) and a smile! Wear your crazy Christmas sweater if you dare! This is a fun morning- NO TALENT NEEDED to create a fabulous wreath just in time for the holidays! Gather you friends! CALL- Linda Kortz - 610-837-7078, 610-905-0007 (cell) to register. Please clearly leave your name, phone and "for the Wreath class", if you leave a message. YOUR seat is then reserved upon receipt of your check. Tonight the Wolf Academy hosts Berks County's fabulous blues band "Pawnshop Bound", with our own Rick Young joining in for a few songs. In the Ralston-McKeen House "A Guy & A Girl" - a great duo covering classic rock, standards and so much more! Tonight’s tastings by Bangor Trust Brewing! Delicious food for purchase by Macungie Mountain Herb Farm. Candlelight and blazing fireplaces add to the ambiance! Upcoming Tavern Nights will be Jan 11, Feb. 8, Mar. 8, and Apr. 12. Please note: NO Tavern Night in December, so this is your last chance to check it out until January! Site & Museum Open - cancelled for today! So sorry, we are not able to open our buildings today. Typically, all buildings and the Museum are open from 1:00 to 3:00 the 3rd Saturday of the month from April through November. Tonight the fabulous BC Combo with Bev Conklin will be in the Wolf Academy! The BC Combo brings their wealth of experience and passion to Blues, Jazz, Swing, Folk, R&B, Soul and more. The BC Combo is among the Lehigh Valley’s top performing groups being honored since 1999 by the Lehigh Valley Music Awards. In the Ralston-McKeen House will be Joe Argese on acoustic guitar and vocals. Also in the RM House will be Banter’s Hard Cider tastings. Upcoming Tavern Nights will be Nov. 9, Jan 11, Feb. 8, Mar. 8, and Apr. 12. Back by popular demand - Rhythm, Rockin', Boogie band "Midnight Shift" with Mike Mettalia will play in the beautiful Wolf Academy. In the Ralston-McKeen House the acoustic sounds of Jeff Louw “The Musing Pilgrim”. Gallows Hill Spirits will be there with spirits to sample. Hot food for purchase, along with free light snacks and soft drinks. A display of historic firearms and accoutrements, along with a historic lighting display will add to the fun. This is the first Tavern Night of the new season, so please plan to come out! Every August, in lieu of our regular board meeting, we travel to a local historic site. This year we are going to visit the Fenner, Snyder, & Robacker Home, and the Old Mill in Sciota.